You can make a telescope for around $25 in materials. You can make one for $50 that will amaze your friends and family, and show you things you didn't know existed. It can be done in a few weeks. However, telescope-making can get messy. You can break a piece you've slaved over. Then you walk around in the worst mood you have ever been in. But in the end you have a telescope that people will look at, and through, and say, "You couldn't have made this." Yes, you did, and that is the best part of all. 2.1 How Will You Use Your Telescope? People have been making telescopes for 400 years, and it's no surprise they've built a vocabulary of specialized terms. In this section we'll take a quick look at some of the most important, and provide links to pages that explain them in more depth. Follow those now, or come back and follow them later when you feel the need for more detail. The first telescopes were refracting telescopes. In a refracting telescope, light passes through two or more lenses. The right combination of lens shapes brings the light from a small area to focus on the retina of your eye, giving you a magnified image. A basic problem with a refracting telescope is that different colors of light are bent by different amounts. The red light comes to a focus at a very slightly different point than the blue or green light does. The result is a fringe of rainbow color around bright objects. Camera designers tinker endlessly with lens materials and coatings to avoid this false color problem. Small inexpensive refracting telescopes can often be found at surplus and used merchandise stores very cheaply. Amateurs can make refracting telescopes. You need a magnifying lens of long focal length, called the objective lens, paired with one of short focal length (the eyepiece). A usable objective lens can be salvaged from many types of equipment that use projection lenses and other optical components. The reflecting telescope is designed around mirrors, not lenses. The light does not pass through a lens and is not refracted. It is simply reflected. Since there is no refraction, all colors of light are affected equally, hence there is no problem of false color. It is not as hard to shape a perfect mirror as you might think. Our first project, the Newtonian Reflector, requires mirrors, and we will make them. It is really very easy to do because (as you will find), physics is on our side. Catadioptric telescopes are a sort of hybrid. They use both lenses and mirrors to focus the light. We need a few technical terms. The first two are focal point and focal length. The focal length of a lens, or of a curved mirror, is the distance at which it brings incoming light to a focal point, or simply focus. The curvature of the lens or mirror surface determines the focal length. The less the curvature, the longer the focal length. The greater the focal length, the greater the effective magnification of the image. As a general rule, the greater the focal length, the less the impact of imperfections in the curvature. The less the focal length, the more critical it is to have a perfect curve. The Newtonian Reflector Telescope is an extremely simple and efficient design. It consists of two mirrors in a tube. That's all! The larger, curved mirror directs incoming light to a focus. The smaller, angled mirror shunts the focused light out the side of the tube, where you can place your eye to see the image. In the Newtonian reflector, the smaller mirror is flat, but in a related design, the Cassegrain, it is convex. Read the Wikipedia article on the Newtonian Reflector for its history. After we consider how you will use your telescope, we will get deeply into how we choose the exact shapes and sizes of these simple pieces. Then we'll build it! How Will You Use Your Telescope? How will you actually use your telescope? Most folks, me included, spent a lot of time dreaming about making the telescope without giving serious thought to how we might use it. I talked about looking at stars and planets—but I also talked about looking at birds and retreating snow fields. Only when I looked through the telescope did I discover some problems. One is, the basic Newtonian telescope makes everything look upside down! Looking at the stars? This is not an issue. Looking at birds or scenery? We have a problem. Fortunately you can buy an inverting eyepiece that will turn things right side up. A second issue with the Newtonian telescope is that it is by design quite powerful. This means you might be looking at a bird's feather detail, not the bird. Third, the telescope is much larger than a pair of binoculars and needs to be supported so you can aim it and hold it steady. I don't want you to stress over this, but you need to consider, what will you do with the telescope? The telescope design covers everything from the optics (in our case the two mirrors), the brackets that hold those optics and keep them aligned, and the tube assembly that contains it all. Design also includes the supporting framework that holds the tube and lets you swivel and point it. That piece is called the telescope mount. So let's say you think that you mainly want to look at planets and stars in the sky. Longer focal length telescopes give higher magnification. That is just how it works: the longer the focal length, the more magnified the image at your eye. Bigger mirrors will gather more light, but two telescopes with different sized mirrors will give the same size image at the focal point, if they have the same focal length (although, since more light is being put into the same size image with a larger mirror, the image in a telescope with a larger mirror will be brighter). Mirrors with a long focal length are somewhat easier to make and more forgiving of error. However, the longer the focal length, the longer the telescope, making it more difficult to move around and to store. Shorter focal-length telescopes give less magnification, but a wider field of view. The image is a bit smaller but that is rarely an issue when looking through the eyepiece. The mirrors require a bit more work, a different technique, but they are as easy to make as the long ones. A shorter telescope is easier to move, easier to store, easier to set up for use. There is no right answer here. The telescope you make should be one you are comfortable with and will use. I have made a lot of telescopes in the last few years. My first--I called it the Long Dog--had a truss design that took about five minutes and 10 bolts to set up. The truss poles were six feet long. It was heavy and long and you had had to stand on a ladder to reach the eyepiece, but it gave images that would take your breath away. I got one of my favorite comments while using that telescope. I showed a friend the planet Saturn. It was a perfect night, calm sky, dark, Saturn was high. He looked at the planet and said, "That is so amazing it doesn't look real." That is what we call resolution. Regardless of the length and size of telescope you choose to make, you will find the information to build it here. I am going to do two mirrors and several mounting ideas for this, the first project of the book. I will grind and polish a shorter focal length mirror and a longer focal length mirror. Whatever you decide on I will cover it here and you will be successful with your first telescope. Time to get into the details of design. The following will have some basic math and some pictures to help. Having considered the physical size of the telescope and the use to which I want to put it, I can now begin to consider the optics. The focal length depends on the choices made while thinking about the telescope. The focal length is set by the shape of the curve in the front of the main mirror. We make that curve by grinding the mirror. The amount of grinding and the depth of the curve are both directly affected by the choices made while thinking about the telescope. It is the front surface of the mirror that forms the image, so it is the front surface that gets all of our attention. The back of the mirror may get quite beat up during this process. That is OK, as long as we don't crack it or put big chips in it. The curve in the front of a telescope mirror is called the Radius of Curvature, abbreviated ROC, or sometimes just R. The front of the mirror is a smooth bowl-shaped depression. Imagine a ball, and if you have one handy, look at it while you read this. The ball has some radius, the distance from the center of the ball (an imaginary point inside where you can't see it, but it is there) to the inner surface of the ball. That is the ROC. It defines the ball's size, and the curve of the surface. Now imagine that we cut off a small slice of the ball, or press the surface of the ball into some soft material, clay or moist dirt. Either way, we have a shallow, smooth, bowl-shaped depression. It would be curved just like the front surface of a telescope mirror. The surface of the mirror has a uniform curvature that determines its focal length. The mirror is usually circular; it is a circular patch cut from that imaginary ball. It can be any size; ours will be a few inches across. (For comparison, the mirror of the Subaru telescope on Mauna Kea in Hawaii is 8.2 meters, 27 feet.) The radius of the mirror, one-half its diameter, is denoted as r.
The depth of the bowl-shaped curve that is ground into the front of the mirror is called the sagitta. There is a math formula to figure out how deep to make the sagitta to achieve a specific focal length. The formula relates the ROC and r, which we know to be the radius of the mirror, to S, the sagitta. The formula reads, multiply the radius of the mirror times itself, then divide it by two times the Radius of Curvature. Huh? Well, we can measure the diameter of the mirror with a ruler or tape measure and divide it in half to get the radius of the mirror. If it is eight inches across, the radius is half of that or four inches. But how much is the ROC? Well, remember how the focal point moves as the light source moves away from the center of the ball. When the light source is at infinity, or a long way away, the focal point is halfway between the center of the ball and the surface of the ball. So the focal length is one half the Radius of Curvature, one half the ROC. I asked, why am I figuring out the ROC when it is just another way of saying two times the focal length? Why not just use the focal length in the Sagitta formula? Two times the ROC is equal to four times the focal length, so why not use this? Well, you can. For our purposes as amateurs we can use either and it will be good enough. So! let's figure out a Sagitta for an eight inch mirror with a focal length of forty eight inches. Not much, is it? 0.08333 inches, (and those threes go on forever). It is about the thickness of a (U.S.) penny. A ream of paper is pretty close to 2 inches thick. There are 500 sheets in a ream. 250 sheets times 0.08333 is about 21 sheets. How accurate do you have to be? How close to a four foot telescope do you want? The focal length of the mirror will determine, to some extent, the length of the telescope tube, and for quick consideration you can assume the focal length of the mirror and the telescope tube are the same. But note that In practice the telescope tube will be as much as 25% longer than the actual focal length. If a five-foot telescope sounds too big, you can re-do the formula for a 3-foot focal length, or any other value you want. We have spent several paragraphs on the primary mirror and I have only shared the basics. Many good books and web pages document the making of the primary mirror. Look at the links at the end of the book. Now we need to consider the second half of the optics, the secondary mirror. How big this secondary mirror should be, its shape, and where it should sit relative to the primary, are functions of the basic measurements of the telescope. In the previous section we used an 8 inch mirror with a 48 inch focal length as an example for our calculations. I will continue to use that example in this section. Secondary mirrors are generally oval in shape. They are referred to by the minor axis. A 1-inch secondary mirror that is one inch wide by about 2 inches long with an oval shape. You can use a rectangular mirror of the same general dimensions and it will work fine. If you hold such a mirror and rotate it on its minor axis so it is at 45 degrees to your line of sight, it will foreshorten and look round or square depending on the shape of the mirror. Before we can calculate the size and location of the secondary, we need to think about the telescope tube that supports the mirrors. How long should it be? How big in diameter? How far in will the primary mount? If we were to size the tube at just the diameter of the primary mirror, it would be difficult to mount the mirror in the tube. Also, a part of the surface of the mirror would be wasted. The outer edge of the mirror would be vignetted by the tube wall, and the image would suffer from reflection and diffraction, a bending and scattering of the light by the tube wall. This would add a lot of unfocused light around the image and reduce resolution. Adding space between the mirror and the tube wall lessens this effect. The tube needs to be bigger than the primary mirror; by how much? A safe number is one inch clearance around the mirror. This works out to a tube that is two inches bigger in diameter than the primary mirror. For the 8 inch primary that is our example mirror, the tube would be 10 inches in diameter. Tube length is determined by the focal length of the primary mirror, plus the space at the end for the primary mirror and the mirror cell—that is, the framework that supports the mirror and holds it perpendicular to the axis of the tube. The typical primary mirror and cell form a stack about 3 to 4 inches in height. Add that to the focal length and you would have a tube that is long enough (remember, part of the focal length is turned sideways by the secondary mirror). A little extra length, say 3 or 4 more inches, gives a shield that works to block stray local light. Our example mirror has a focal length of 48 inches. Add 4 more for the mirror and cell, and 4 more for blocking light, and we have a tube 56 inches in length, and at least 10 inches in diameter. So, how big shall we make the secondary mirror? Before we can answer we need to consider one more key dimension, the focal offset. The offset is the distance from the middle of the secondary mirror, essentially the middle of the tube, to the focus of the image. Figure it as the radius of the tube, (half the tube diameter), plus the height of the focuser fully racked out. I use three inches for that number since I do not buy focusers. So the offset for our example telescope is 5 inches plus 3 inches or 8 inches. A formula for figuring the size of the secondary is as follows. We multiply the diameter of the primary mirror by the focal offset and divide by the focal length of the primary mirror. This gives us a minimum minor axis. A second rule of thumb is, the secondary should be no bigger than 20 percent of the primary mirror diameter. Given an 8-inch primary, that is 1.6 inches. Purists haggle over these numbers forever. My opinion and experience are, a secondary that is a bit too big is preferable to one that is a bit too small. The formula yields a size of 1.33 inches. This is a minimum size. You could increase it by 25% and have a better secondary fit. 1.33 x 1.25 = 1.66 inches—which just happens to be at the 20% mark. Pretty cool, huh? That's it! That is how, beginning with the diameter and focal length of the primary mirror, we decide on the tube diameter and length, and the size of the secondary mirror. The formulas are important enough that I have included them here on a graphic that will make a 3 x 5 card. Print it out! These formulas and the considerations that lead to them will guide your second telescope and every telescope you make after that first one. But next you need to teach your hands how to grind and polish a mirror, and that is best learned on simple inexpensive stuff. What do we use to make a mirror? Strictly speaking, all we need in a telescope mirror is a hard, polishable material. We can shape almost any hard, polishable substance with a simple mechanical process to get the optical curve that we need. Glass was originally basic soda-lime glass, like what we would call window glass or plate glass today. Softer and easier to work than the metal, it could be polished out perfectly. However, glass expands and contracts with changes of temperature. The change in size as a telescope adapts to chilly night-time air makes for a nasty transition period before you can view the stars. The glass will move enough to mar the figure of the mirror—its ability to direct all of the light to one point—and you are basically stuck until the mirror equalizes with the environment. This can take an hour on small mirrors. Many different blends of glass have been tried in the search for glass that would not distort in this way. Pyrex is harder and does not expand as much as soda-lime glass does. Fused Silica, and other exotic processes yield a glass- like material that is harder and will yield a mirror that hardly changes at all. But you can make a mirror out of any material that will take and hold the shape of the mirror's curve, and many materials have been used. You can make a mirror out of various rocks: Cryptocrystalline Silica will work. I have a mirror made out a rock called Chert. It worked fine. Volcanic glass or Obsidian has been used. The point is, if you can grind and polish it, you can make a mirror out of it. For the first telescope mirror I am going to use something common and inexpensive: the ubiquitous Pyrex pie dish. Now, if you happen to have a piece of glass or something that you want to work with, use it. If you find a more traditional piece of glass while shopping for your pie dish, don't feel obligated to go with a pie dish. Use what you can get that is within your budget. Any piece of glass will work: drink coasters; those big glass disks they put under decorative candles; glass serving platters; a big glass ash-tray. They are all glass, they are all round, they will all yield a mirror. The color of the glass does not matter. The glass can be any color, even rainbow. We will coat the working surface with an opaque reflector when we are done, so who cares! There is one type of glass we must avoid: tempered glass. Tempered glass, often used in automobile windows, glass shower doors, and other places, is put under stress when it is made. Because of this built-in stress, when tempered glass breaks, it shatters in many small pieces. It is likely to shatter suddenly when its outer surface is scratched or abraded—for example, when a would-be telescope builder starts to grind on it! There is an easy test for tempered glass using polarized sunglasses. Polarizing "shades" are cheaply available, or can be borrowed. While wearing them, hold the suspect piece of glass up to the light and rotate it. Does it show a pattern of dark and light spots? These spots show the internal stress of tempering, waiting to shatter. Unfortunately our preferred mirror source, the heat-proof baking dish, is nowadays sometimes made of a tempered material. If the dish is well-worn and has visible surface scratches or abrasions, it is likely not tempered (or it would have shattered already). If it is new and shiny, test it with polarizing glasses. Now prowl the glass aisle of the local thrift store with this caution in mind and three criteria: Roundish, a smooth curve to the bottom, or flat and thick enough. If the bottom has a curve already the glass can be thinner than if you have to grind the curve into it. How much curve? Let's say you are looking at a pie dish. The outside bottom, which is what we will work with, should have a pretty smoothly concave curve. Hold it upside down with the concave bottom up against the front edge of a straight shelf. The gap formed by the glass and the shelf is our sagitta! Or the beginning of it. There should not be any big bumps or dips in the curved surface of the glass when compared to the straight edge of the shelf. However, don't worry about any embossed words or logos. They grind right off. How deep is that curve? A U.S. dime is 1.3mm thick, a penny is about 1.5mm, and a nickel is almost 2mm. (Yes, the U.S. Mint uses metric dimensions for its coins.) Hold the bottom of the dish up against the shelf edge or any straight edge. Can you slide a nickel through the gap between the bottom curve and the straight edge? If not, then a penny? Or if so, two dimes? You should be able to come to a good estimate of the depth at the deepest part of the curve. Let’s say a penny is a loose fit but a nickel won't quite go. It's fair to say the curve is 1.9mm deep. Now measure the diameter of the bottom of the plate. A Pyrex pie plate sold as a nominal "ten-inch" plate (it will probably say 25cm on the bottom) is almost exactly 8 inches across the bottom. One sold as a nominal "nine-inch" dish is about 7 inches across the bottom. That will be the mirror diameter. You have two parts of the saggitta formula, what is the focal length of that pie pan bottom? 101.5 x 101.5 = 10,302.25. 4 x 1.9 is 7.6; 10,302.25/7.6 = 1,355.6 Our focal length is 1.355 meters, or (again we refer to our metric converter) about 53 inches. There are a lot of "abouts" in the above calculation because we have been casual about measuring the depth of the curve. It is more than one penny but not a nickel, or not two pennies. The coins might be worn. There may be a hump in the middle. On and on the guessing goes, but really, it isn't worth sweating over. Most glass pie dishes have a smooth regular curve on the bottom and will yield a mirror 7 or 8 inches in diameter, with a focal length between 36 and 48 inches. But right now we are getting our mirror material and we should stay on track. Maybe you see a big old ashtray that is about six inches across and has a generally smooth curve on the bottom. Testing with coins and a straight-edge you find that a penny will just slide between the shelf edge and the glass. Sagitta? 1.5mm. Diameter is about 6 inches so radius is about 3 inches, or 76mm. So r2 is 5,776, divided by (4 x 1.5 = 6) is 962mm. So that ash tray will yield a mirror that is about 6 inches in diameter with a focal length of about 38 inches. Just to be sure I knew what I was talking about I spent a few hours wandering around in various thrift stores, doing the things I talked about here. Yes, people will look at you strangely. Well, remember, Einstein was once considered a weird old man too. I found five odd bits of glass that I bought for and average of $1.99 each. Two glass platters cost me $2.99 each, but they will yield nine and one half-inch mirrors. I got three pie dishes, two glass platters, and one white glass plate with an 8-inch bottom having a 1/8th inch deep curve. What is the focal length of that white plate? I also found a 7-inch glass disk just a tad shy of one inch thick. I have no idea what it was for. It looks like some kind of fancy trivet or maybe a candle base. It is flat, so I will have to grind the curve in before I smooth it out. That is OK, it is plenty thick enough to take a curve. While you are out shopping buy at least one extra pie plate, we need it to make the tool—the surface that we grind against. Go for cheap here, we are going to break it up into pieces so the cheaper the better. Now go find your mirror. There are other parts to the telescope, and you should be looking for those parts while you look for your primary mirror. You will need a secondary mirror, as described above. You will need a mount to hold the primary and the secondary mirror. You need a tube for the scope; a focuser assembly; an eyepiece; and finally, a mount for the telescope so you can point it where you want it. When you begin to put the telescope to serious use there will be other things (like a finder for aiming, or a telescope cover) that are handy to have, but the parts listed above are essential. To actually grind the mirror you will need a tool and some grit, as well as some polish. The secondary mirror is usually an oval shape, but may be rectangular. More important than the shape of the secondary is the flatness of its surface. Both of our mirrors are first-surface mirrors; that is, they reflect light from the top surface. The typical mirror in which you admire your pretty face is is not a first-surface mirror. Its reflective layer is applied to the back of the sheet of glass, and reflected light passes twice through the thickness of the glass. This is practical in a mirror for a bathroom or a cosmetic kit, because the delicate reflecting coating is protected by the glass. But in a telescope we cannot tolerate light bouncing back and forth through glass. The secondary mirror must be a first-surface mirror that is optically flat, and that is very flat indeed. You can polish a secondary mirror to be flat and I will cover how to do that later on, but there are some sources of glass and mirrors that may answer the need without all the effort of making one. There are lots of places where you might scavenge a first-surface mirror. Some old Polaroid cameras have a first-surface mirror in them, and can be found for pennies on the dollar at thrift shops. Old photocopy machines have very flat first-surface mirrors in them, as do overhead projectors, some slide projectors and movie projectors. Even if you cannot find the mirror in an old photocopy machine, the flat glass on the top—or the flat glass on the top of a discarded flat-bed scanner—is a good source for material to grind your own secondary mirror. Learn to share! Team up with a friend who also wants to make a telescope and go halves on some of these parts. You might also check local swap meets. See if there is a astronomy group in your area. If you can befriend an old amateur telescope maker, he or she will have lots of this stuff laying around. You get involved in this hobby, and the stuff just appears. In a year or two you have to shovel out a load or you drown in the stuff. There are sources on the internet for old optical parts. I have listed a couple at the end of the book, but searching for used, scrap, or surplus optical parts is an adventure, and can yield a lot of good usable stuff, cheap. The best thing to do is just keep your eyes open and your needs list at hand. Lastly, get to know the owner of your local glass shop. Cut-off bits of thicker window glass can be ground flat and used for a secondary mirror. You can start with a simple rectangular mirror now and upgrade to a better-shaped secondary later when you find one. In a way it is kind of like your first bicycle or car or whatever. You get it, and get it going, and make it better over time. We will make the mounts for the mirrors as well as the focuser assembly from scrap and scratch. Keep an eye out for popsicle sticks, tinkertoys, big roundish plastic or wood things like bucket or barrel lids. We use small springs, maybe an inch or so long, to isolate the main mirror. Motorcycle clutch springs are great and are usually thrown away when they are replaced (ask at your local motorcycle dealer). Glue, tape, and cardboard: watch for cardboard of all sorts from cereal boxes to refrigerator boxes. White plastic buckets such as restaurants get bulk food in, or contractors use for paint and mortar. One or two of those are enough. Toilet paper tubes, paper-towel tubes, the big tubes used to deliver carpeting or vinyl flooring. Christmas wrapping-paper roll tubes. Plastic plumbing pipes for sink drains: these are usually 1.5 inches or 1.25 inches inside diameter. The 1.25 inch ones are better but either will work as an eyepiece tube. Old plastic vacuum cleaner pipes. You can skip ahead to the chapters on tube design and focuser design to get some idea of how these parts will be used; then keep an eye open for them. Much of this is considered trash or recycling. To recycle it into a telescope is, I think, the highest purpose. Grit is a material that is harder than the glass from which the mirror is made. It is used to grind the surface of the mirror to shape it and make it optically smooth. Think of the grit on sandpaper; that is what we are after. (But sandpaper itself is not a good source of grit for our use.) You can use fine sand or black sand but you will use a lot. The harder and more irregular the grit the less you will use and the less time you will spend grinding. Lapidary suppliers are a source of grit and polish. Check your local telephone book. Some industrial-supply houses have sand blasting grit, and that can be used. I have purchased or salvaged worn out and broken grinding wheels and crushed them up to make grit to grind with. You want loose grit, as it cuts by rolling around between the surfaces of the mirror and the tool. Old-timers have used iron filings and washed sand. Under the microscope the coarse grits look like little sharp round rocks. The oxide types of grit are rusts from various metals. They look like little plates and cut by shearing. If you search the internet you will find suppliers for grit and polish. I have listed a couple of sources below. You will need some 120, some 220 (I get this as a blend of 120/220), some 300 to 400 grit, some aluminum oxide or micron grit and some cerium oxide for polish. The 120 and 220 are for coarse grinding to remove irregularities form the pie plate bottom. The 300 - 400 and aluminum oxide are to smooth it out for polishing. And the cerium oxide is for polishing. You will need a pound or better of the coarse and half a pound of each of the finer grades. 8 oz of the cerium oxide should be enough. To make the mirror for a telescope we grind an optically perfect surface onto the material chosen to make the mirror. Simple, huh? It actually is pretty simple to do. The physics of the interaction between the mirror and the grinding tool assures us that one will develop a hole while the other develops a hump. Lets look at that process. Take two flat (or nearly-flat) objects of the same size. Place one on top of the other, with abrasive grit between them. Now press down and grind the upper against the lower. The surface that is on top will begin to hollow out or develop a bowl shape. The surface on the bottom will wear at the edge and develop a high center. It does this because of the stroke, the stroke length, and the pressure we apply with our hands. The longer the stroke the deeper the hole. Shorter strokes flatten the curve. We will get into this a bit more later on, but for now I want you notice that when you grind the mirror—the upper piece that becomes concave—you are also grinding the tool, the lower piece. The action of the grind shapes both, and this is exactly what we want to have happen. As the grind progresses mirror and tool become a perfect match. This interaction gives you several indications of how the grind is going. The sound of the grind, the feel of the interaction between mirror and tool under your hand, the bubble pattern that develops between the two surfaces, are all indicators and you will learn to monitor them as you grind. The tool will become the base for the polishing lap, the final stage of grinding. How well you shape the tool will affect how easy or hard it is to create the lap. Tradition is to get two disks of glass the same diameter and grind. The top one becomes the mirror, the bottom one becomes the tool. That doesn't work with pie dishes: a pie dish makes a good mirror but not a good tool. Fortunately the tool does not have to be an optical surface; it just needs to be a tool. Its surface must be durable enough to survive the grind, but must be soft enough to accept shaping by the grind. A tool is easy to make and that is what I recommend for the first mirror. The simplest way to make a tool is to cast one out of some material. Plaster is cheap and will work to make a tool. You must be sure to seal it against water, as the water will soften the plaster and cause it to fail. Concrete is more durable and as easy to work as plaster; so is tile grout mix. Ceramic clay can be shaped and fired and used for a tool. You can use wood for the tool if you can match the curve of the glass pretty close. The reason that all of these various materials will work is because you use them only to form the base of the tool. When the base is ready, we glue a grinding surface to the base. The grinding surface is what gets shaped, and this too can be made of many things. Probably the easiest material to use for the grinding surface is broken glass. Ceramic tiles can be used, as can washers, pennies, flattened marbles, decorative stones. Each will respond to the grind, each will grind in a particular way. Any of them are a valid choice. My favorite tool is cast plaster or concrete, with broken glass glued on to form the grinding surface. That is the one I am going to discuss in the greatest detail but it is not the only way to make a tool. Your finished tool should match the curve of the pie plate pretty closely and should allow you to attach a grinding surface. It should be roughly the same size as the pie plate bottom, but if it is a bit smaller that is not an issue. If it is bigger than the mirror, it will make a flatter curve and increase the focal length. if it is substantially smaller, say half the diameter, it will work but will require you to be very vigilant while grinding. Grinding, as you will see, is a wet process. If the tool absorbs water, that can interfere with the final stage when we adhere a coat of pitch to it. That is why I use glue and glass. The glue between the tool base and the grinding surface provides a barrier that prevents moisture from getting to the pitch adhesion zone and the glass does not absorb water. BUT! you do not have to make a tool. A ring is a section of any sphere larger that the ring. You can prove this to yourself by putting a ring against a larger sphere. The open end of a can, the mouth of a jar, the end of a pipe, these are all rings. Get a ring and hold it against a ball, a light bulb, the inside of the pie plate. You will find that the ring sits easily against the sphere. The reason I bring this up is that you can use a ring for your tool, at least in the coarser stages. So you could do a lot of the initial grinding with an old soup can, and that is a very valid thing to do. You will still need a larger tool for later but to get started you could use a ring. So! if you chose a pie plate to use for the mirror and if you decide to make a tool right now, get two and break one up for glass for the tool. Please! Use sense and do this in a safe way! Do not just grab a hammer and hit the plate, scattering glass around the shop (and perhaps into your eye). Wrap the sacrificial dish in a sturdy paper bag and put it in the bottom of a container or box. Put on eye protection and gloves. Strike the wrapped plate with a heavy object. Wearing gloves, carefully open the bag. Pick out and set aside flat pieces of roughly 1-inch size (2cm and up). Irregular shapes are fine. If there are larger or angled pieces, wrap them up and hit them again. Finally, sweep the working area thoroughly and dispose of all the small slivers, crumbs, and unusable bits in a safe way so they cannot injure anyone else. You can cast a tool base using concrete, plaster, grout mix, or any hard, castable medium. I make a casting form using 2-inch tape to form a dam around the bottom of the inverted pie plate. You want a tool base that is at least one inch thick. Place the pie plate on a hard level surface, bottom up, and wrap tape around the base to make the form. Spread a release material—cooking oil works well—on the glass and the inside of the tape. You want a good coat on all surfaces but not a flood. Now mix up the casting material and pour it into the mold created by the tape ring on the pie plate. Let the casting harden and then peel off the tape. You should be able to separate the casting from the pie plate with a bit of pressure. If it does not want to come apart, tap the side of the casting with a light mallet of some kind, a short piece of wood works well, all the way around the perimeter and push on the casting while bracing the pie place against something. If you got a good coating of oil on the glass the casting will pop off. The casting will have a raised edge due to the curve of the surface on the pie plate where the side joins the bottom. Youl need to remove that raised edge. You can grind it off with a wood rasp or just rub it against a curb or the sidewalk. If your casting material is too hard to grind you can chip it off with a hammer, but you need to get that raised edge off, leaving a flat or bevelled edge. Now finish and seal the top surface of the tool where you will attach the grinding surface with a thin layer of epoxy glue. You need a tool base, cast or shaped, carved or whatever and some glue to attach the grinding surface onto the base. I like 5 minute or 15 minute epoxy glue. The cost is reasonable and it will glue just about anything to anything. Prepare your grinding surface material. If you are using glass pieces make sure they are all in one place and ready to be glued on. If you are using washers or pennies, flattened marbles, or chunks of ceramic tile, make sure you have enough to cover the tool. The grinding material should all be the same thickness, no mixing of obvious thick and thin pieces! If you are using a ring to grind you are done. Skip down to the grinding section in making the mirror. The tool base is the same basic shape as your mirror and should be a match for the tool. If you made a cast tool base it is already a good fit to the mirror. If not, you can take the flat material you are going to use for a tool base, the disk of wood or the bottom of a pan, or even that big round candle base, and make it fit a bit closer. Get a piece of plastic sheeting (heavy plastic wrap will work, as will plastic bags) and cut a piece that will cover the tool base with some overhang. Remember! the tool base should be about the same diameter as the pie plate bottom. Get a tube of epoxy glue and squeeze it all out into the middle of the base. Mix it well and then cover it with the plastic sheeting. Now take the pie plate and press it down onto the plastic-covered glob of glue. This will cause the glue to be flattened and squeezed out over the surface of the base. Rock and slide the pie plate around on the plastic to spread the glue under it so that it covers the surface of the base and takes on the curve of the pie plate. I squoosh it around until the base is covered and then I center the pie plate and press down pretty hard to make the hump shape. Then pick the pie plate straight up. Leave the plastic in place and let the glue harden. Once the glue has hardened you can peel off the plastic and you will have a hump on the tool that matches the pie plate curve pretty close. Next, mix up some more epoxy, enough to spread a thin layer over the working face of your tool. Into the glue set the pieces of the grinding surface. You can have spaces between the pieces; just cover the tool as densely as you can, and make sure it is all well glued down. Place the pieces so there are no high edges sticking up. The tool is ready. Let's grind! Three tools: the one on the left is made from a candle trivet using the squashed-epoxy method to form it to a pie dish; the one on the right was cast to a pie dish. Everyone talks about grinding mirrors, but very few do it. Grinding takes patience, dedication and a desire for perfection. I have all three but I have never made a perfect mirror. Some people have. Mel Bartels has made several perfect mirrors, as has Jerry Oltion of TrackBall fame. Don't let "perfect" scare you, "average" works well. When you start with a pie plate, the hardest part of the grinding process, the basic curve, is already done. (That saggitta that I have hammered on all the way to this point.) All you need to do is smooth the glass and make the curve regular. Take the pie plate and aim its bottom at a bright light and refect that light onto a surface. For example, take it outdoors on a sunny day and reflect the sun onto a wall. Move the dish toward and away from the wall and see if you can tell where it is most focussed; it should be at about the focal length you computed earlier. You will probably see a somewhat focussed, but scattered, amorphous blob of light. That is because even though the surface is curved, it is irregular and covered with high and low zones. You will grind the high zones down till they equal the low zones, and then polish the glass. It is really very easy to do, physics is on our side. When we are done the surface will be optically smooth. Grinding can be done with the tool on top, (TOT), or the mirror on top, (MOT). The position of the mirror and the length of the stroke will change the resulting curve of the glass. Long strokes deepen the curve, short strokes flatten the curve. MOT is more apt to deepen the curve, while TOT tends to flatten the curve. These are general statements about the interaction of the mirror and the tool, but the interaction is there and you should be aware of it. Long strokes deepen; short strokes flatten. A maintenance stroke, one that doesn't really change the curve but just works the glass, is a 1/3rd diameter, center over center stroke. Center over center means just that: the center of the tool passes over the center of the mirror, or fairly close to it. The 1/3rd part means a stroke with a total length of 1/3rd the diameter of the mirror. If you were to measure that stroke you would measure it at the center. In practice we gauge the stroke by how far we overhang the edge of the bottom piece, tool or mirror. Since the total stroke should be 1/3rd the diameter of the blank, (the pie plate), you overhang by half that at each end of the stroke. Say that our pie plate is about 7 and 3/8ths inches across on the bottom. One-third that diameter is about 2 and 1/2 inches, so you will overhang on each end of the stroke by 1 and 1/4 inches. Push away from you, and the piece on top should overhang by 1 and 1/4 inches when you stop. Pull back towards youself till you have that same overhang, and stop. That is one stroke. In practice the strokes vary greatly, maybe as little as an inch of overhang, maybe as much as two inches. Don't sweat it. That irregularity will produce a very good surface, maybe a perfect one. Just go for an average of an inch and a quarter and grind. "Less talk, more work," as John Dobson would say. If you are working indoors you should have a bucket of water to rinse the mirror and tool in. If you are outside, you can spray them off with a hose. John Dobson likes to work on a board placed over two buckets. He can sit on one end and grind on the other. I like the top of the washing machine because it is the right height for me, and it is heavy enough that it won't move when I grind. Some folks use a bench or table for the surface. The main concern is that the work surface be durable, easy to clean and should not move or shift when you grind on top of it. It should also be comfortable, as the work of grinding is taxing enough with out adding body contortions to it. When I use the washing machine top I have a board that sits on top of the machine, and the work is on top of that board. A board is a good thing in that it allows me to pick up the whole mess and move it to storage when I am not grinding. I also put two stops on the board to keep the mirror or tool from moving around (as shown in the diagram). Prepare your tool, some medium-coarse grit (120 is good) and some water. Since we are going to maul the surface with tool and grit, you can start with the pie plate on the bottom and the tool on top. This will use the grit efficiently and there is plenty of grinding ahead to correct errors. Splash a little water into the curve of the pie plate, and add a good pinch of grit, enough to make a little hump about an inch in diameter and half an inch high. You can put your grit into a shaker of some sort so you can shake it on like salt, or keep it in a jar and dip it out with a spoon. Put the tool on top; push away; pull back. There is a nice soft gravelly sound and you have done one stroke! You are going to work your way around the circumference of the mirror making strokes. You should rotate the tool a bit too. The classic instruction is to take a step to the left and rotate the tool to the right after each stroke. As you work the two surfaces together, the gravelly sound will diminish. When the noise is very soft you have finished one wet. A wet runs from the first stroke to the next charge of fresh grit. Push the tool away and lift it off of the mirror in one movement. Add a bit of water and some more grit; put the tool down gently; and grind some more. After three or four wets, rinse the tool and the mirror with water. Then put them back on the board, TOT, and start grinding again. The grit wears down as it cuts the glass. When it is fresh, the grit is dark gray, almost black, and it sparkles. When it is used up it is very pale, almost white, and looks like mud. The color change is due to the introduction of glass dust into the water/grit mix. If there is a coating of mud on the glass, the grit won't cut well, and you need to rinse. As you cut away the high spots, zones of ground glass spread across the surface. This is a good thing; it shows where the high and low spots are. It also gives us a ready made grinding gauge to check our progress. Initially the grind will go slow and your tool will be rough to push, catching and jerking as you do your strokes. This is because the tool and glass of the pie plate do not match well. As you grind the two surfaces together they will wear and the strokes will become smoother, more consistent. As you grind the clear glass will give way to frosted glass. That frosted surface is smooth and soon enough you will polish it. In all the pie plates I have done there are always two final little clear spots, opposite each other, that seem to take forever. First one will disappear, then the other one will go away and you will have a perfectly smooth surface. The reason it takes so long is you are removing glass from the whole surface to get down to the bottom of those two zones. As deep as it looks, it is a very small percentage of the overall thickness of the glass bottom. When the last clear spot is about the size of a dime, about 1/2 inch in diameter, I switch to the medium grit. For me that is 400 or 500 grit. I grind with that grit until the last clear spot is gone. Now I'm ready for the fine grind. Keep your strokes full diameter; resist the urge to scrub one spot. That will make a hole that will take a lot more work to get rid of. You do not need to press down hard, just a light pressure or, if the tool is heavy enough, just use the weight of the tool will do. Push it back and forth with nice long strokes, 1/3rd center over center. Rotate the tool, and rotate the pie plate the opposite direction, or walk around it so you are on a different diameter. One stroke a second is plenty fast enough, one every two seconds is better. We all have an inborn rhythm and if yours is too fast then time yourself. I really get to moving sometimes, and to slow myself down I will chant: "One one thousand" as I push away; "Two one thousand" as I pull towards myself. There is no need to be precise in your movements, just consistent. The randomness of your strokes and constant rotation will create a perfect optical surface. Just to give you an idea of where you are and what you are doing: at the end of your medium grind, if you have been consistent, the two surfaces will match to within one ten-thousandth of an inch. That means they will be a perfect pair to within 0.0001 of an inch. Good stuff, but by the time you polish it out you will be working to within a millionth of an inch, and in figuring (final optical correction) you will be moving fractions of a wavelength of light! "Grinding is caveman work. Work hard, eat well sleep well," says John Dobson. The fine grind is more of the same, but we use a different agent. We will switch to Aluminum Oxide. This looks like flour or powdered sugar, but it is a very hard, very fine abrasive. If you cannot find Aluminum Oxide, Tripoli will work but it cuts slower. Aluminum Oxide comes in several grades but for our purposes 25 micron or 12 micron is what we need. If you use 25 micron, extend your wets, make them longer, and use plenty of water. Add a table spoon or two every few minutes. If you use 12 micron it will wear out quicker, so you will change it more often. Rinse both the tool and the pie plate between each wet. The aluminum oxide will make a nice froth at the edge of the tool. The stroke will be very smooth, almost silent. Stay slow, resist the urge to speed up. Don't press down hard on the tool or the pie plate, use gentle pressure. Harder pressure will gain nothing and may cause later problems. If you are using a full size tool you can work MOT every other wet. If you are using a ring, stay with TOT but you need to start thinking about a full size tool on which you can build the polishing lap. You grind with the Aluminum Oxide until the surface looks smooth and has a fine matte finish. You should be able to read a newspaper through the glass, not only the headlines but the regular print. Take the pie plate out into the sun or use a very bright light and examine the ground surface. Look at it from the edge, rotate it and look again. If you have a small magnifying glass, look at the surface with that. What you are looking for is sparkles. If a big bright sparkle of light shows up in the matte surface you should grind more. The sparkles are tiny pits. You can grind them out but you cannot polish them out. Grind as long as you need to in order to remove the sparkles. A wet of fine grinding may last several minutes, maybe as much as ten minutes, and include maybe a couple of hundred strokes. It is hard to say how long the fine grind will last, as it depends on you and your technique, but I would expect to use at least an hour, maybe two or three. When the mirror surface is uniform and free of sparkles, we can polish. The mirror is polished using a different tool: a _lap_. A lap is a tool covered with a layer of deformable, pliable material. Some telescope makers claim that it is pliable because as you polish the mirror the surface changes are very fine and the lap changes accordingly through pressure. Others say this is not true, rather that a lap is covered with a soft material to trap the grit and shave the glass through pressure. A third group says the polishing occurs not due to shaving the glass but through melting the glass through pressure. One book will say pitch is the only stuff for the lap surface; another will say asphalt; another claims paper works. Some say soft cork, beeswax, or paraffin wax. Well, the lap is really not that complex. Lets talk a bit about the polishing process and then I will tell you how to make a lap. Polishing is the last step in preparing the mirror surface. The surface is rendered optically smooth and is shaped to bring all the light to one point of focus. The action that takes place between the lap and the glass is a rubbing action. Up to this point we have been moving the glass over the tool with a grit between them. The grit tumbled along between the two surfaces, chipping off little bits of glass as it rolled along. Now we want the grit to stay in one place and just scrape the high points off. To do this we have to trap the grit and hold it in contact with the glass. If everything is in balance there is a constant drag between the two surfaces when we make our polishing strokes and that is what we want. A common word found in the various arguments about laps is _pressure_. A second word seen is _contact_. Pressure helps to bring the polish up. Good contact polishes the surface uniformly. Pressure and contact together produce the sensation of _drag_, which is an indicator of the polishing taking place. So the material of which the lap is made should be able to handle pressure and keep good contact. Any material that can do this will make a usable lap. Some material, like pitch or wax, is more forgiving than harder materials, but that does not mean they are the only materials. Asphalt will work but you have to use a different approach to the polishing. Paper will work, as will rubber or soft, smooth, fine-grained cork. One last thing, is the final shape of the mirror. The curve that best focuses the light of a telescope mirror is the parabola. This curve is a bit flatter than the sphere. Right now, if you have been consistent in your grinding, the shape of the mirror surface is spherical, more or less. There are two ways to change that into the parabolic shape. You can polish the middle of the glass a bit deeper and then blend the two curves, or you can flatten the existing curve a bit by polishing the edges a bit more. A rigid unmoving lap will polish the edges first and the center last. A softer, formable material will usually polish the middle first and the edges last. So the lap material will affect how you finish you mirror as it will affect how the polish is worked across the surface of the glass. If you have been using a full-size tool, you continue to use that tool as a base for the lap. You will be covering its surface with lap material. Because it has been ground to a close fit with the mirror, you will be able to use any lap material including paper. If you have been using a ring to grind the mirror, it is time to set that tool aside. You will have to make a tool backer the full diameter of the mirror to support the lap. This can be a flat disk of plywood, or you could cast a tool (as we discussed under [the Tool]). Because this tool has not been ground into a perfect fit to the mirror, you will not be able to use a paper lap. You will have to use a pliable material such as pitch. Pitch is the first choice for a soft lap. You can harvest it yourself if you have conifer trees: go into the forest and pick globs of pitch off the trees. Or search for "pine rosin for sale" online. The pitch should be hard when it cools, but not too hard. The hardness of the pitch depends on the proportion of volatile materials in it. To test the pitch, press on the surface of the cooled pitch with your thumbnail. If it takes longer than a minute to leave an impression, or if you can't dent it, the pitch is too hard. Warm it back up and thoroughly mix in a teaspoon of turpentine. Let the pitch cool and test again. Repeat as needed. If the pitch dents easily and immediately, it needs to be harder. Bring it again to the temperature of boiling water and stir for a few minutes. You should be able to smell the volatile chemicals coming off the pitch. Cool it again and test it; it should be harder. Repeat as needed. A good pitch will take about 30 to 40 seconds to dent when you press into the surface with your thumb nail. Pitch is sticky and adheres to surfaces and clothing. To clean it off skin, use baby oil and warm water. To clean it from surfaces use turpentine or nail-polish remover. If you do not have pitch, beeswax will work very well. Paraffin wax will work but will require greater attention to contact. I would not use sealing wax or crayons; the coloring in them will scratch the mirror. I mentioned asphalt earlier but I have never used it so I cannot advise you on its use. There may be some web resources on using asphalt for the lap. The different materials respond differently to heat but they do not need to be bubbly, runny hot. They only need to stick to the tool backer and be soft enough to shape with pressure. Take your tool backer and make sure the surface is clean and dry. If you are using your grinding tool, wash it, dry it well and dust it off with a stiff brush. Take a strip of paper, or a piece of tape, and wrap it around the top perimeter of the tool backer to form a dam. This so you can pour the lap material onto the tool and it will not run off of the edge. The dam should be about 1-2 inch or 12mm high. If you used paper for the dam secure the end with a bit of tape or something sticky. A bit of egg white will work, or some liquid glue. Make sure the strip is tight around the tool. Heat the lap material as described above. When it gets gooey and pourable (but not runny) you are ready to pour the lap. You can stir the lap material and check the consistency with a clean stick. If you are making the lap on a flat backer, pour a bit of the softened material onto the center of the backer and let it firm up. It should not cover the backer, just the middle. This will give you a bit more thickness in the middle where you need it. While you are waiting for the lap material to soften get your mirror ready. It plays a significant role in making the lap. Have it nearby and put one drop of dish washing detergent or a teaspoon of soapy water in the middle of the mirror. To this add a pinch of polishing grit, Cerium Oxide or Tin Oxide or Tripoli, whatever you decided to use (See [Grit]. Now use your fingers and spread this watery paste all over the mirror surface. Add more water or polish as necessary. You should have a slighly muddy slurry all over the surface of the mirror. When the lap material is ready, pour it onto the tool backer. Pour onto the middle and let it run to edge. The paper dam will stop it and the material will begin to fill the surface of the tool. When you are near the top of the paper dam stop pouring and let the material settle. Now wait and test. Smear the polishing slurry around on the mirror surface with your fingers and then touch the surface of the lap. You will leave finger prints in the material. You want the material to be stiff enough that finger prints form but remain and not fill in. If they fill in, wait, smear the polish around on the mirror and test again. The reason you keep smearing the polish around is that it puts a coat of polish and water on your fingers so the pitch or wax doesn't stick to them. And it keeps the mirror ready for the next step. Once the lap remains dented when you test with your finger prints remove the paper dam. Do it quickly and it will come off in one piece, like pulling off an adhesive bandage. Now put the mirror on top of the lap and just smear it around. Push it all over the lap. You are shaping the top of the lap to match the curve of the glass. Be quick and then lift the mirror off. The whole shaping step should only take about 30 seconds at most. Take a stick and press it into the lap to form shallow channels. Hold it by the ends and push down into the lap material. Start at the middle and make 3 or 5 channels across the lap, one in the middle and one or two on each side of the middle one. Now turn the lap about 90 degrees and make some cross channels. The lap should now have a grid, a checker board, look. Take the mirror and press it onto the lap and smear it around. If the mirror looks dry add more water and polish and press the lap. Work consistently but don't get into a frenzy; you have time. Try to keep the channels open with the stick and press and rub the mirror across the surface of the lap to form it. When the lap is firm but warm, put a good coating of polish and water and soap on the mirror and set it on top of the lap, centered on the lap. Pour the pie pan full of water and just let it sit there. The weight of the water in the mirror will shape the lap to a perfect match. This is a trick we will use to keep the lap in trim as we polish, press then polish. If the lap is hard but you didn't get a good shape, if there remain obvious low spots, warm the lap again. Put the partly-formed lap and tool into a large container and pour in warm water to cover the lap. Let it sit for a few minutes and test the surface with your thumbnail. When it dents easily pull the lap out and shape it with the mirror. Repeat as necessary. Always have a good slurry of polish and water on the mirror before you put it on the lap. Soft pourable material would use the process described above. But what if you want to use paper? Paper requires a tool base that has a perfect match to the mirror. If you used a full size tool to grind the mirror, it has that match. This process is used for a dry polish. Take a piece of heavy paper and cut a circle out of it that is as big as the tool. You can use a large paper bag or heavy printer paper. Newspaper is too thin and flimsy. Spread a thin layer of glue, egg white works well here as does wheat paste, over the tool and press the paper on top. Smooth it out from the middle, pressing all the bubbles out the edge. Make sure it is glued from edge to edge. When the glue has dried, rough up the surface of the paper a little bit with a stiff brush or very fine sand paper. Then using your fingers spread an even coat of dry polish all over the paper surface. Smooth cork will work the same way but it should be very thin. Rubber will work but it is hard to get a good bond and the polish will not always stick to the rubber. We are shifting techniques. The stroke is the same but because we are using a powdery grit and a tool with a softer surface, the glass will be planed smooth, as opposed to the chipping tumbling action we have used up to this point. Because of this we need to press down a bit harder, put more pressure on the surfaces, to get a consistent action. I have mentioned drag a couple of times but now I want to explore this idea in a bit more detail. When the two surfaces, the mirror and the tool, match very well the entire area of both surfaces is in good contact. Because they are not smooth there is a friction between them, and this friction causes drag as the two surfaces move past each other. The greater the pressure the stronger the drag. This translates to a smooth consistent resistance to pushing or pulling the mirror across the surface of the tool. If you have poor contact, the mirror will skip and jump. Consistent drag will be absent. The other problem that can make drag inconsistent is that you do not put a consistent pressure on the mirror and the polishing action becomes irregular. Maybe you push down harder as you push away, so the glass under the heel of your hand will work more than the glass on the leading edge. This can round edges or dig out the middle. So drag is a constant tactile measure of the quality of the polishing action. With a pliable lap, if the contact degrades you can press the two surfaces, cold press the lap, and regain your contact. Hard laps of paper etc. need to be stripped and replaced if you lose contact. We have about an hour or two of fine grinding left to do before the polishing starts. We are going to work the mirror on top from now on. The glass of a pie plate is too thin to do this work mirror on the bottom. One good thing about having the mirror on top is we can fill the pie plate with weight and gain more consistent pressure as we work. In fact, you can just load the pie plate and move it back and forth, never pushing down on it, and get an excellant polish. If you are working with a pitch type of lap, fill the pie plate with water before your start your strokes. If you are working on a paper type lap that would absorb spilled water, place a bag of sand or some other granular weight into the pie plate. The grit of choice for the fine grind is the Aluminum Oxide or Tin Oxide, both of which are referred to by size. For our purposes we will use 25 micron for the fine grind and save the Cerium Oxide for later. If you don't have a 25 micron grit, you can use the Cerium Oxide. The fine grind will take a while to work but it can be done. For polishing we use Cerium Oxide. The particles of a polishing grit are planar, not lumpy. There are two schools of thought on using these planar grits, dry application versus slurry. In a dry application the pitch lap is wetted and the grit is sprinkled on dry and rubbed with your fingers until it has absorbed the water. Now the mirror surface is wetted and polishing strokes begin. In the slurry method a container is charged with water and grit and stirred to create a slurry. This slurry is spread on the mirror or the lap and polishing commences. I like the slurry technique myself: one step and I have water and gritr. A paper lap is charged dry and worked dry. Just sprinkle the grit on and spread it with your fingers, then start polishing. Put the lap on the work surface and _charge it_, that is, put some grit on it. Lay the mirror on top and weight the mirror. A polishing stroke is slower than a grinding stroke. Count the cadence. Push away "one-thousand-one." Pull back "one-thousand-one." The movement away should take the whole 1001. The pull back should use the whole 1001. Remember to rotate the mirror slightly as you stroke. Push. Pull. One wet of polishing can take a full hour before the grit is worn out. How is the drag? It should feel consistent, smooth, resistive. If the glass is gliding, not dragging, you have too much grit or water or both on the lap. Speed up for a while till the drag increases; then slow down. Every now and then you should turn the lap a bit, this will prevent astigmatism in the mirror shape. Working on a lap is hard work and you will spend as much time polishing as you did grinding to the point you could polish. When the drag begins to reduce, or you get tired, push the mirror away and lift it off the lap. This is easier if you are using paper as you can remove the weight before you lift off the mirror. With water you have to lift the whole thing and dump the water. Rinse the mirror and dry it and look at the surface. It should be markedly smoother, perhaps a bit shiny. Your goal in fine grinding at this point is to grind the surface smooth enough that you can read a news paper through the frosted glass. It takes about an hour of work to progress to the next grit size, so be prepared to put in at least an hour of final fine grinding before you switch to the polish. To switch to polishing you need to clean everything. If you are using a paper lap it is time to peel off the existing piece of paper and glue on a new piece. Remember to rough it up a bit before you charge it. Once you have charged it try some strokes, how is the drag? If it feels pretty good, load on the weight and start polishing. If not you may have to put a new paper on. Make sure you use the same kind of paper you used on the first lap. If you still lack contact try building up the lap a bit by rubbing some parafin wax on it. Then put some more polish on top of the wax. You should be able to get contact with some work using these two techniques. If not, you may have to make a pitch lap. With a pitch lap, scrub it well with a soft brush under tepid water, more cool than hot. Make sure the channels are in good shape. Make a thick slurry of Cerium Oxide and water and smear this onto the lap and the mirror. Put the mirror onto the lap and fill it with warm water. Keep it on there for at least an hour, occasionally moving it around like you did when you made the lap. You are forcing contact and charging the lap all in one stroke. After an hour you can start to do polishing strokes. How is the drag? How does it feel? If the contact feels good go ahead and polish. If it is slipping, jerky, let it press some more. There is really not much more I can tell you. Just polish. As you do the mirror surface will get shinier and the reflectivity will increase. When you think it is polished out, polish for another hour and then check with your magnifying glass. Use a harsh light at an oblique angle, that will make the hazy areas jump right out. You want no haze, period. No little glints, no fuzzy zones. The middle might be polished but the edge is probably still fuzzy. The mirror surface should be as clear and clean as the sides of the pie plate. You can polish out a pie plate in 8 hours or so, although your first one may take 20 hours. You are learning how to polish so you are really doing two things at once, polishing and learning to polish. You don't have to do it all at once. An hour a day over two weeks will polish that glass and give you breathing time in between. Slow and steady, count the cadence, polish! _Figuring_ is that time in the process of grinding a mirror when you adjust the curve of the mirror so that all of the light it collects will come to a tight focus. At least that is the goal. The strokes used to figure the mirror are essentially the same strokes you have been using to polish the mirror. They are a little longer, the sweep side to side is a bit wider, but you will be rubbing the mirror over the tool with that same measured cadence that got you to this point. The difference is that when you figure the mirror you monitor and measure your progress by looking at the surface and testing the focus and then determine what you will polish to correct the errors you have seen. That is why figuring is also called _correcting_ the mirror. Initially we will look for gross correction and gross errors. Once you have done those checks you will need to make a decision about how you will test and monitor the correction. That decision will determine your next steps and the equipment you will need to build or borrow. Lets do some testing. Does the mirror come to a focus? Even as polished clear glass your mirror will reflect light. Polished glass will reflect around 5% of the light that strikes it. We can use this to test for focus and quality of focus. The simplest test is to hold the mirror under an overhead light and look at the reflection. Is it a spot? Is there detail associated with the reflection? Can you see the printing on the light bulb, in the reflection? The sun also works for this, as will the full moon; you just need a target to focus the reflection on. Another reflection test can be done with a portable light, like a flashlight or torch, in a dark hall. Place a flat surface of some type next to the light. You will use this for a target. Try to reflect the light onto the target. Once again look at the quality of the image. How much detail can you see? A better test involves using the view of what is outside an open window or door while inside a darkened room. You will need to place the mirror on a steady support so that it reflects the view seen through the opening. You will stand between the mirror and the opening and look for the reflection. Try and put the mirror about eye level as it will make the image easier to find. With the mirror set up to reflect the light from the opening, position yourself closer to the opening than the mirror. Look into the mirror and search for the reflection. The mirror will begin to glow as you get to where the reflection is and then suddenly you will see the view outside the room reflected in the mirror. Stop for a moment and relax. Enjoy the view noting as much detail as you can. As you relax your vision the image will appear to be floating in space. Now for a twist on this test. If you have a simple lens like a magnifying glass you can move towards the floating image and examine it with the lens. How much detail can you see? This is a great test to use on a full moon. You can see the craters. In effect you are using your telescope! Now to the analysis of what you saw. If the image is fuzzy, that is probably due to the lack of correction; but take the time to examine your polishing job. Is it really complete? If you reflected a round light such as the sun onto a target, but the image was oval, not round, that is _astigmatism_. If the target was not in a direct line between the mirror and the sun, then it is probably _positional astigmatism. The bigger the angle between the source and the reflection the more astigmatism you will see in the reflection. However, if the image was formed in a pretty direct return line, the mirror itself is astigmatised and you need to drop back to fine grinding to straighten it out. How about the dark room reflection? I do this test in a room where there is a tree outside the door. I find the floating image of tree leaves. When I look at the image with a little magnifier I can usually see the veins in the leaves if the mirror is pretty good. What did you see? Now put it all away and do the tests again later or even tomorrow. You are teaching yourself how to look at reflections and make some quality decisions. Let your eyes rest and think about what you saw. Write down your observations so you can refer to them later and see if anything changed. If you did the test during the day, do another test at night using distant lights, or the stars or the moon. Write down what you see and compare notes, then act. Test a lot and work a little, that is how to approach it. If reflections that should be a little circle of light are always oval, then the mirror is astigmatised. This means there are two curves on the surface, not just one. This usually happens because you did not rotate the mirror enough while grinding, but it is also caused by flexing the glass, pushing down too hard. Go back to the 400/500 grit level and grind till the surface is frosted. Don't push so hard when you do grind; just use a little bit of pressure. I had this problem a lot when I first started to grind pie pans. Then I started to use a bit of water in the pie pan and then just pushed it back and forth under its own weight, and no more astigmatism. Do this regrind with the mirror on top and then work your way back to polished. If the reflections looked pretty good, but were hairy or fuzzy, that could be poor correction, but it could also be a turned edge. If everything else looked good then we need to move to a more delicate test. If everything looks good, no fuzzyness, good detail, then we just need to see how good the surface looks. There are a few ways to do a detail test on the mirror surface each involving their own technology. Of these there are two that can be done with little in the way of equipment and the results are very good. One is a star test; the other is the Ronchi test. Both have their strengths and their weaknesses. The Ronchi test will show an over-all surface condition. The star test proves correct figure. I do both, but you can do either or even some other test that you find on the internet. It comes down to the tools and materials you have and your environment. Here in the Pacific Northwest we have very few stars in the winter. Either test will require some equipment be constructed. To do the star test you will need to build the rest of your telescope: the tube, the mount, the secondary mirror. You have to build these parts anyway, so this gives you a little more incentive. Build the scope and then test the mirror. The Ronchi test requires a Ronchi tester but these are very easy to build. In fact you can build a simple ronchi tester into an eyepiece and test through the focuser of your telescope. This is called null testing. Mark VandeWettering has graciously allowed us to post his web page on Ronchi testing here in the book. It is a good primer on the test and I reccomend it. Either way you have reached the end of your mirror work for now. Put it away in a safe clean place and start building your tester. 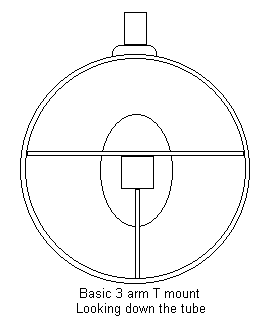 The secondary mirror mount must hold the secondary mirror at the proper position in the tube and in the optical train. It must allow for minor adjustments of both of these positions, and retain the final position without slipping. The mount is actually made of two parts, a mirror mount and a tube position mount. There are just a few considerations to think about .. 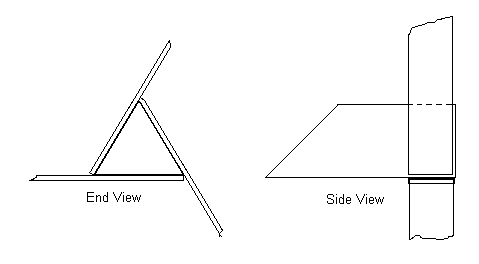 The mirror must be held without tension so that the surface is not distorted, which would impact the image. Hard adhesive products shrink as they cure and squeeze the glass, which in turn distorts the surface. Mechanical attachments, clips, rings, etc. must allow the mirror to "float," because the differing rates of expansion of the different materials can squeeze or bind the glass. When you decide what mirror mount to use you should also consider how that mount will be attached to the tube position part of the assembly, and how it will be adjusted to get proper collimation of the optical train. One of the oldest secondary mirror mounts is a simple mechanical mount. A short piece of tubing, a bit bigger in its diameter than the minor axis of the secondary, is shaped by cutting one end at a 45 degree angle. Small L-shaped clips are made and screwed or glued to the outside of the tube to retain the mirror. The mirror is placed in the tube and cotton balls are loosly packed in behind it to hold it against the clips. The tube is then capped on the open end to hold the cotton balls in. The idea is that the mirror just floats in the tube, which takes all of the stress of mounting. 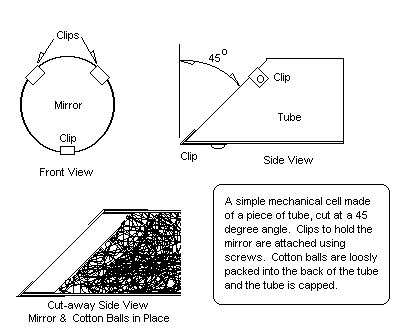 The mirror is given its basic orientation, held at the proper angle, by cutting the end of the tube at 45 degrees and holding the mirror against that plane with cotton balls. The mirror and the tube have about the same cross sectional area in the light path so additional obstruction is minimal. This is a very good mount although it can be a bit difficult to make if you are short on tools. The tubing used can be plastic or metal or cardboard. You want a tube that is a little oversized so it doesn't squeeze the mirror. You could make one of these out of a toilet paper tube and it would function well. The clips could be of thin wood, (popsicle sticks), glued on. The 45 degree angle on the front end should be as accurate as you can get it (find someone with a carpenter's mitre box and use that to cut the tube), but final optical alignment is accomplished with the tube-position part of the mount. An angle that is a bit off is not a big deal. This mount is very good for the large secondary mirrors found in larger scopes. Another type of mount is made from a simple piece of wood or plastic or even metal. Take a dowel, or even a square or rectangular piece of material, that has ends smaller than the secondary mirror. Cut one end at a 45 degree angle. Now you can glue the mirror to the 45 degree face and you are done. Remember that hard adhesives will squeeze the glass as they cure, so use a non-hardening adhesive. Silicon rubber, also called room temperature vulcanizing rubber, RTV for short, will hold the mirror but will not squeeze it as it cures. It also resists temperature changes, so expansion and contraction are not a factor. It is a spongy material and will buffer the mirror from shocks and changes in the mount. You should use three small blobs to form the bond, not one big smooshed-out blob in the middle. Use some toothpicks or small wood skewers to space the mirror away from the mounting surface, so that the glass and the mount are not in direct contact, but are held together by three blobs of soft adhesive. Another possible adhesive for this mount is double-sided foam tape. Get the thickest core you can get. I use this stuff everywhere on the telescope to mount all sorts of things, so a roll is a handy thing to have. You must make sure the cut end of the mount is very smooth. Sand it off very smooth, and seal it with a layer of nail polish or epoxy. Now just cut a single piece of the double-sided foam tape, put it in the middle of the mirror-back, and stick it on the cut face of the mount. The foam core provides the same sort of mechanical and thermal buffering that we got with air and rubber and it is much easier to use. The danger in using an adhesive-based mount lies in not getting the mirror glued on squarely. The mirror must have its minor axis perpendicular to the eyepiece for the minimum amount light obstruction. The simplest way to make sure it is properly lined up on the mount is to make some index marks on the mirror and the mount prior to gluing. Get a sharp pencil and a ruler. Lay the secondary mirror face down on a piece of paper. Lay the ruler edge along the major axis. Get as close as you can but don't lose sleep over it. 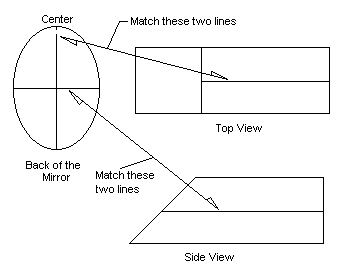 Draw the diameter line for the major axis of the mirror on the back of the mirror. Now measure the major axis and divide it in half. Make a mark at the center of the major axis line and use the ruler to draw the diameter line for minor axis through that mark, as in the drawing above. Get as close as you can and try to make the intersection of the lines at the middle of the mirror perpendicular to each other. Now take the piece of material you are using for a mount and draw a straight line one each side of the wood, as close to the middle of the side as you can. When you glue or tape the secondary to the mount, line up the lines on the mirror with the lines on the mount and you will be close enough. These simple adhesive mounts will work well for smaller mirrors, the kinds of mirrors we will be using to make a pie pan telescope. Larger mirrors require a better mount and some form of mechanical mount would be best for those mirrors. There is a hybrid of these two forms that can be used for big mirrors. Make an oval that matches the shape of your secondary mirror. Glue and screw that oval to the mount face, or weld it on if you are using metal. The oval should be made of good solid material. You should line it up using index lines, just as you lined up the secondary in the above procedure. Now glue your secondary mirror to the oval using several small blobs of rubber or several pieces of tape. The mirror is well attached to the oval by the adhesive, and the oval is mechanically attached to the mount assembly. You could add a couple of small clips to the oval to help support the secondary mirror. Remember, the mount should not pinch or squeeze the mirror. Now that the secondary mirror mount has been made or chosen, we need a way to place it in the telescope tube. 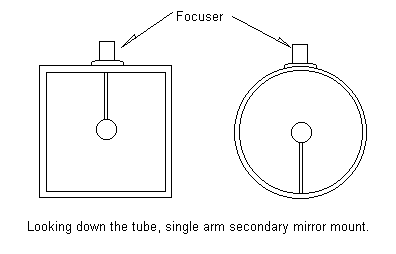 The secondary mirror should be mounted in the very middle of the tube to catch the focused image from the primary mirror and turn it towards the eyepiece and focuser. This process is decided more by measuring than anything, but there are some tricks we can use and there are many ways to position the secondary in the tube. The first step is to measure the telescope tube diameter inside and outside. You can do the math and size the mount accordingly, but I like to draw a full size diagram and work from that. I take a piece of paper at least three or four inches bigger than the outside tube diameter. 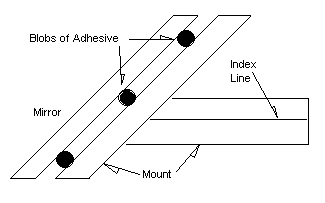 Draw lines across the paper from corner to corner using a straight edge. Where the lines intersect is the middle of the paper. Now I use a compass to draw a circle as big as the inside diameter of the tube, or a square if I am using a square tube. Now I can play with various ideas for mounting the secondary mirror in the tube. I can get real measurements and understand what I am going to be working on. Lets talk about some mounts. The simplest tube mount is a single arm that supports the secondary mirror mount at the right place in the tube. The arm is usually attached to the tube near the focuser hole, or on the opposite side. This avoids one source of distortion from gravity. In use, the focuser will be on top of the tube; if the mount was on the side, it could flex downward from gravity and make it hard to collimate the telescope. Single arms are quick and elegant but they have a fatal flaw: they vibrate. That one arm with the weight of the secondary mirror at its end is a pendulum. Bumping the tube will make it vibrate for a while. If you use a thicker material and one that dampens movement, for instance a soft wood, you can minimize the vibration, but it will always be there. My early telescope, "The Long Dog," had a single arm secondary mirror mount. It could be irritating but I did a lot of viewing with that telescope and I never swapped it out for something else. Attaching the single arm to the secondary mirror mount can also be a challenge. If you use a piece of threaded metal rod, you could bore a hole through the mount and one through the tube wall. Then you could attach and center the secondary with nuts and washers. That is what I used as a single arm on "The Long Dog," and it gave me an infinite adjustment to center the secondary in the tube. Final collimation was accomplished by bending the threaded rod to position the secondary mirror. If you want to glue the arm on you need to be sure the mirror is in exactly the right place and that will stay there while the glue dries. A variation of the single arm is a design using thin parallel strips, closely mounted and flexed together to form the single arm. This is basically a triangular truss and cancels all vibration. Collimation is achieved by moving the secondary mount on the truss. The friction of the material holds the alignment, or you can glue it up and fix the position pemanently. See the drawing below for details. You can make this assembly out of popsicle sticks, clothes pins, or just thin scraps of wood. It could also be made from stiff plastic. This is the mount I use in my pie pan telescopes. It is also in my rock scope. Really the only consideration is that the material used be flexible enough to not break when it is bent through the secondary mirror mount. You should cut out the slot on the mirror mount prior to mounting the mirror on it. The slot should only be as wide as three or four pieces of the strip material you are using. There is no need to go wider at the top than 3/4 of an inch. A shorter set of arms would be better served by an even narrower top end, say 1/2 inch or so. The best thing to do is hold the assembly in your fingers and squeeze the ends of the strips to see how much tension there is and adjust the separation accordingly. You want enough friction to hold the secondary in place under its own weight. Three-arm mounts are an old and reliable standard. The arms are cut to the length necessary to hold the secondary in the middle of the tube. They are then mounted equidistant around the secondary mirror mount so that by their very length they center the mirror in the telescope tube. John Dobson has used the three-arm design forever it seems. Once he has the assembly put together he puts it in the telescope tube, collimates the scope, and then glues it in place. He recommends, and I agree, that the arms should not be round or square, but flat and thin, with the thin edge placed towards the tube opening. This gives a better strength to the tube mount. You can make this mount quite easily in wood. Make the mirror mount out of a piece of wood cut to the shape of an equilateral triangle. (Think of a long prism.) Now cut the 45-degree end for the mirror to mount on. Make the three arms and glue and screw or nail them to the end opposite where the mirror will attach. Make sure they are perpendicular to the mirror mount. I cut the arms over-long, then size them for length by centering the assembly on my full-scale drawing and marking the arms there. Once it is assembled and the glue has dried, attach the secondary mirror and put the assembly in the telescope tube. John Dobson does this mount using a dowel. He cuts a groove in the side of the dowel at 120-degree intervals and then glues each arm into place in its groove. 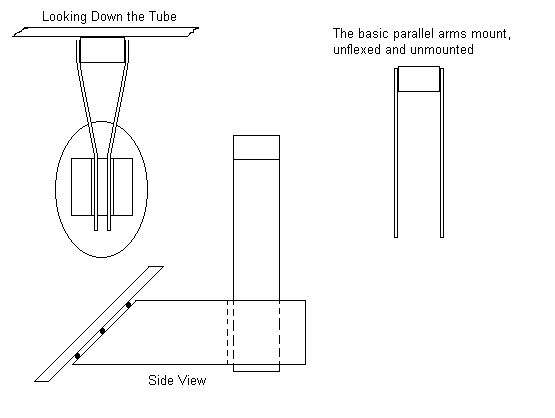 A variation on the three-arm mount is a T-mount having a single arm that goes all the way across the telescope tube, and a second short arm that runs from the mirror mount to the wall of the tube. These are a great design as they are simple to do. They combine well with a square mirror mount. Make a decision based on these considerations. Make a complete mirror mount first, including arms, and then attach the secondary mirror. Finally, mount the assembly in the telescope tube. The telescope mount supports the entire assembled telescope. The mount allows you to aim the telescope, and then holds it steady while you look through it. I presume we are not getting into star-tracking clockwork? Got Grit sells grinding materials. They have a good reputation. "Build your own telescope" shows how to set up an extremely low-cost demonstration of how telescopes work. The Cookbook Camera (CCD "Cookbook Camera" Project) was a great resource in 1996 for people who wanted to add a CCD to their telescope. Is "Wikibooks: Telescope Making" the best place to bring it up-to-date? "The Trackball telescope"; OR "The Trackball telescope" describes yet another style of telescope mount that uses a sphere resting against a driven axle to track the stars. "Mel Bartels Mirror Making Page" One of the most respected and quoted amateur mirror and telescope makers. "Telescope Makers Web Ring Home Page" This is the home page where you can list your web site and show off your creation;This is the list of websites in the ring. "The Amateur Telescope Makers list server" You can join the list or just read the postings and the archives. A huge source of information. "Mark's Notes for the Amateur Telescope Maker" by Mark T. VandeWettering. This page was last edited on 4 December 2018, at 18:32.